Strawberry Shortcut Mousse — light, refreshing, the perfect end to a spring meal. It is quick and easy to make and can be dressed up to look quite spectacular without piling on extra calories or carbohydrates! You can also freeze Strawberry Shortcut Mousse in molds or small paper cups for a cool snack enjoyed by all ages! Strawberries were known in the Roman Empire as early as 234 B.C. where wild berries were used for medicinal purposes as well as eating. The berry is also indigenous to North America where Native Americans used them as well. Well before 1600, early colonists were impressed with the native way of mixing crushed red berries with cornmeal then baking the mixture for strawberry bread. They adapted the dish and Strawberry Shortcake was born. The scientific name, fragaria, given them reflects their fragrant nature and their relationship to roses, also a member of the fragaria family. The first fruit to ripen in spring, strawberries are unique in that their seeds are found on the outside. Whether in the garden or the store, choose strawberries that are firm, plump, deeply red and shiny. Once picked green berries will not ripen further. Wash firm berries, do not remove the green caps and they will keep for several days in the refrigerator. Strawberries are nutritious with vitamin C, minerals and antioxidants. Fresh strawberries make great additions to salads, fruit trays and kid friendly snacks. 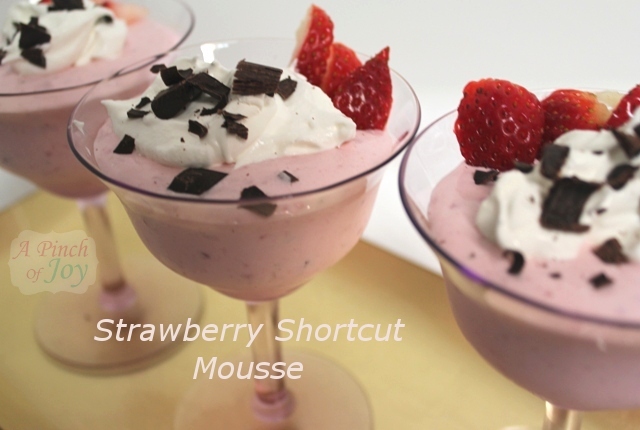 Because of their sweet flavor, they make delicious desserts like this quick and pretty shortcut strawberry mousse. If you are a Bavarian milk producer, tying small baskets of wild strawberries to the horns of cattle will entice woodland elves, who are passionately fond of strawberries, to help produce healthy calves and abundance of milk in return. If that seems a bit strange to ponder, perhaps you will appreciate this more . . . Cool and creamy, a sweet strawberry treat! Puree in blender with syrup until smooth. Yields about ⅔ cup puree. Add milk to pudding mix and beat with mixer until well mixed, about 1 minutes. Add strawberry puree to pudding mix and beat for another minute. Mixture will be thick. Add thawed whipped topping, and stir gently until well blended. If adding fresh strawberry bits, fold in carefully. Spoon into dishes and refrigerate at least one hour. Garnish as desired. Serves four to six. Nice info on the strawberries! And I completely agree with the quote- it is definitely the best berry! Then next for me would be raspberries. Anyway, great idea- looking forward to trying it! Mmm This looks sooo good! I gotta pin it!